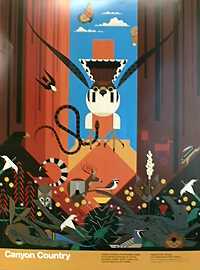 In the 1990s, National Park Service (NPS) commissioned Charley Harper, an American Modernist artist, to design 10 posters of wildlife. They wanted the art to capture the diversity of public lands in America; “from the lava flows of Hawaiian Volcanoes . . . to the icebergs of Glacier Bay, Alaska, . . . from the heights of the Rocky Mountains . . . to the depths of the Coral Reef.” Harper, an experienced traveler, drew inspiration from nature and used his unique style of minimal realism. The poster with Hawaii’s volcanoes shows a typical volcanic eruption that destroys everything in its path but Harper also gives the audience multiple perspectives. Upon closer inspection, the art illustrates how life is created through a destructive force. The archipelago of Hawaii was formed by volcanic eruptions millions of years ago. The image of Hawaii that we know of today is a lush, tropical island with volcanoes. The greenery is direct result of volcanic soil which is rich in nutrients. “[The soil] are light and fluffy, low density and have remarkable water-holding capacity.” Another view is that lava is flowing into the ocean thus creating more land. The island of Hawaii, also known as Big Island, is continually growing and providing more habitats for life. Harper’s artistic style maybe minimalistic but is by no means simple. Can you find multiple perspectives in the Rocky Mountains poster? Several of the commissioned posters are available for purchase at the GPO Bookstore. The Catalog of Government Publications (CGP) is another GPO resource that can be used to discover Government posters. For example, the University of Iowa digitized Harper’s Glacier Bay poster, and it’s available through the CGP. The CGP can also be used to learn more about the extensive research Federal agencies have conducted about natural wonders in the U.S.
About the author: Blogger contributor Vanathy Senthilkumar is a Systems Librarian at GPO. Thinking of traveling to a national park this summer? In addition to being prime time for outdoor exploration, August is American Artists Appreciation Month and the National Park Service’s (NPS) centennial month. Even if you can’t swing a national park trip, Charley Harper’s nature-oriented prints can take you there. West Virginia-born, Cincinnati-based artist Charley Harper (1922-2007) is beloved for his highly stylized interpretive artwork. In the 1980s and early 1990s, NPS commissioned him to illustrate the wildlife of our parks. Based upon his cross-country travels and the stimuli of nature, Harper produced a 10-poster series in his trademark minimalist, geometric style. Four of those eye-catching renderings—Alpine Northwest, Atlantic Barrier Islands, Canyon Country, and The Rocky Mountains—are available through GPO. Alpine Northwest—a bald eagle lords over his dominion, representing Olympic, Mount Rainier, and North Cascades National Parks. Atlantic Barrier Islands —marine birds skirt along shifting bodies of sand and white-tipped tides that one could find on Fire Island, Assateague, Cape Hatteras, Cape Lookout, Cumberland Island, and Biscayne National Park. Canyon Country (Large Version)—the American Southwest’s dizzyingly high pinnacles, buttes, and mesas are a signature of the Grand Canyon, Zion, Bryce Canyon, Arches, Canyonlands, and the like. The Rocky Mountains (Large Version)—a beaver drinks at a pond that reflects the landscape of the great Continental Divide. It’s quite remarkable how Harper’s compositions use shapes to imaginatively depict an entire ecosystem. Bold colors and whimsical lines will brighten a schoolroom, playroom, breakroom, workroom, any room. Each one takes you to a corner of our country’s public lands. Celebrate American artistry and the past 100 years of national parks with Charley Harper’s tribute to wild, enchanted America. HOW DO I OBTAIN THESE CHARLEY HARPER POSTERS? It’s easy to become blasé about the things you deal with on the job. For years, I’ve been seeing a variety of National Park Service posters whose design was along similar lines. They depicted stylized birds and animals, evoking, at least for me, a sort of Native American sensibility. I admit, though, that this is more thought than I actually put into them. If asked, I would have surmised vaguely that the stylistic resemblance was due to some kind of “look” the Park Service was trying to achieve, rather than because they were the work of a particular artist. Recently, we reprinted a number of these posters and our content acquisition staff kept referring to them as “Charley Harper” posters. Then we got an inquiry from the depository library side of the house about “Charley Harper” posters. My first response: Who’s he? Well, Charley Harper (1922-2007) was a noted American artist, particularly esteemed for his wildlife posters, prints, and illustrations in a style he described as “minimal realism.” He’s also an eminently collectible artist, so once again Government publications suddenly appear in a new guise, far removed from the tired old stereotype. These posters are sold by stores in the various national parks and also are available from GPO. It’s easy to pick them out! To see all of the posters and handbooks produced by our Park Service colleagues in Harpers Ferry, West Virginia, go here, where you’ll also find a link to the various parks associations that sell Park Service products. College basketball playoffs are wildly popular and followed by millions of fans, including some in our office. Last year, we came up with the idea of doing a “Sweet 16” playoff of Government publications on GPO’s online bookstore. After working with our web support team, which is both creative and very patient, we launched our first playoff last year. We sent out a message to all of our customers who have requested information about our products and sat back to see if anything would happen. It did! By the time our “tournament” was over, we received more than 139,000 votes and a mention in the New York Times business blog. I think this proves that Government publications have fans, and highly motivated fans at that. The winner? You can find it here. Now it’s March again, and this year it’s a National Parks Playoff, featuring eight National Park Service handbooks and eight posters by the noted artist Charley Harper (who will be the subject of a future posting here). If you get a chance, stop by and vote!